Comments: William Smithson and Mary (Stinson) Roberts farmed the Walter Dorrier farm about 3/4 miles north of Scottsville on Rt. 20. William and his twin brother, Nathaniel Marvin, were born on March 14, 1864, at Massies Mill, Nelson County, Virginia. They were the sons of William H. and Arabel Bowles Roberts, who moved by wagon to Buckingham County when the boys were growing up. 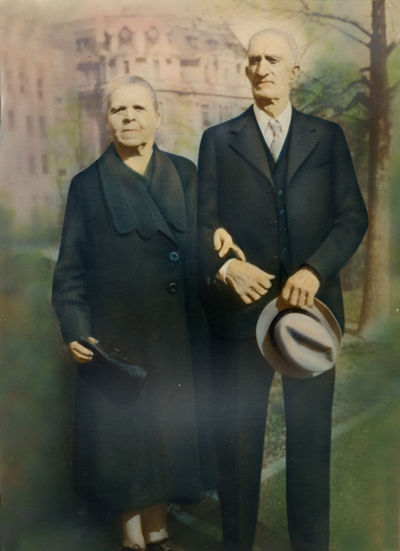 William married Mary Elizabeth Stinson on June 21, 1900, and they became the parents of two children: Earl (1901-1995) and Ruth (1907-2000), who attended Scottsville Schools. Mary Elizabeth (Stinson) Roberts was born in 1874 and was the daughter of Thomas Henry and Elavina Elizabeth (Baber) Stinson and sister of Dr. Luther R. Stinson of Scottsville. 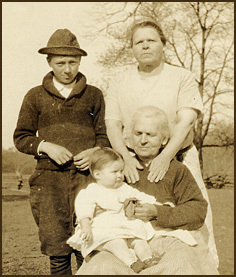 In the 1923 photograph at right, Mary stands behind her mother, Elavina, seated in the chair and holding her great grandson, Earl Roberts, Jr. Standing beside Mary is Billy Stegar, a relative. Mary died in 1958 in Charlottesville and is buried in Scottsville Cemetery. Her husband, William, died in Charlottesville in 1957 and also is buried in Scottsville Cemetery. The photo of William and Mary Roberts above belonged to Ruth Roberts, their daughter. It was donated to Scottsville Museum by Paul Arneson of Fort Washington, Maryland. The photo at right was donated to Scottsville Museum by Paul Roberts of Keswick, Virginia. Paul is the grandson of William and Mary Roberts and resides in Keswick, Virginia.